Makerbot Replicator 3D Printer First Prints! Today my Makerspace Maniacs group met for enrichment clusters. This group is made up of 9 students in grades 2-5. They had already heard that the 3D printer had arrived and they were eager to give it a try. For demonstration purposes, we used the files that were pre-loaded on the SD card that came with the Makerbot in order to print. They voted on what to print and chose Mr. Jaws, a shark that can serve as a paper holder. We went through the menu screens and selected our print and pressed the red M button. We were ready to be amazed, but our print failed! So what happened? It seemed that the filament began to ooze out of the extruder before moving onto the build plate. This caused some buildup that interfered with the actual print file sticking to the build plate. Instead, it got tangled up in itself and made a ball of filament on the plate instead of a shark. Did we give up? Of course not. We used a Rachel Ray silicone spatula to catch the filament oozing out before it moved onto the build plate, and our shark printed great. In the process, we had a great conversation about how makers don’t give up. They learn from mistakes, and they expect that things rarely go right on the first try. 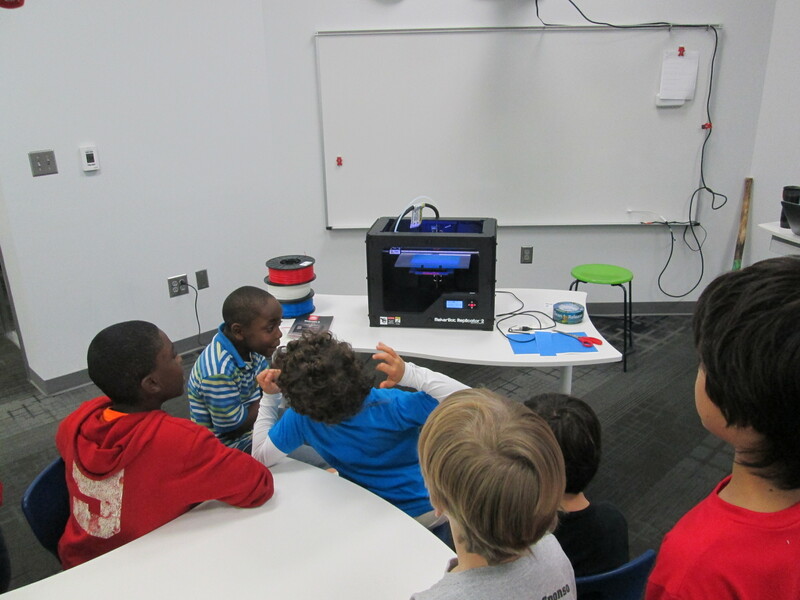 The students were amazed by what the printer could do, and they already starting talking about what they wanted to design. We really have our work cut off for us because we know the process is going to be filled with learning curves. Today, the Athens Banner Herald also came and interviewed me and the students. They were eager to tell the paper their stories of how they plan to use the printer. I hope some of their stories come across in the article. 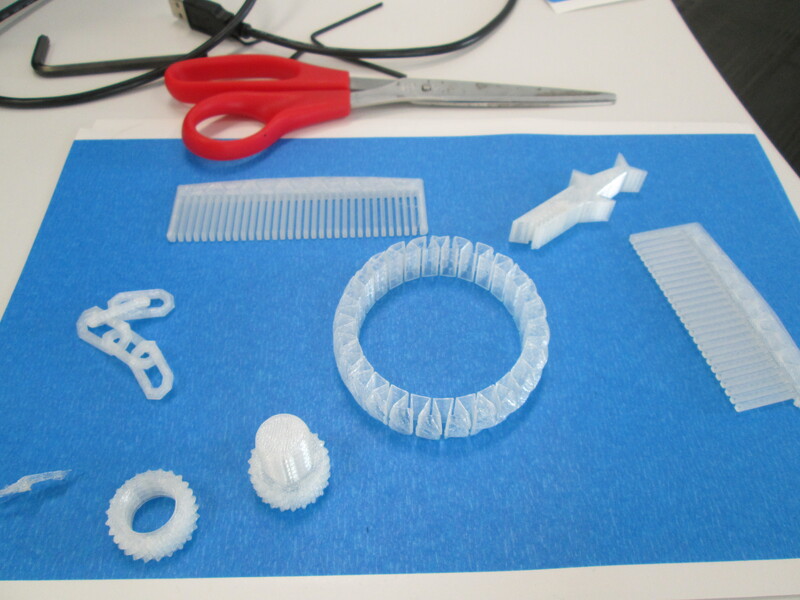 Today, throughout the day I’ve printed the nut & bolt, the chain links, and another stretchy bracelet. I wanted to practice changing filament, so I switched to red for the bracelet. I was surprised at how easy it is to change the filament, and I loved that the Makerbot walks you through each step on the menu screens as well as in the printed manual. I also experimented with how to remove items from the build plate. The painters tape really does help, and so far, I like the flexible Rachel Ray spatulas that I’m using. It was also suggested to me by TimeOutDad to use this Cricut tool from Amazon. Throughout the day, several students and teachers have stopped by to watch the printer print and to talk with me about how we might use it this year. I called Makerbot and got a quote for 12 more rolls of filament as well. Ideas are brewing. We’re already learning lots, and we’re almost ready to venture out into the waters of the unknown. This entry was posted in Art, makerspace, technology and tagged 3D printing, makerbot, makerspace, risk-taking, trial and error. How cool is that!? Your students are on the cutting edge of technology! That’s even cooler! Congrats! I’m a fan! Thank you so much. I can’t wait to see how their first designs print. I know that we are going to fail often and learn a lot along the way, but we’ll have fun! So awesome! Thank you for letting me experience this through your writing. I’m dying to get my hands on one! Holly…you are welcome to come try it out anytime. You should post a project. Funding is running low, but you never know what might happen if you post your project. Have you thought about using a donation site again for the filaments? I’d be happy to support this! Paula….thank you so much. I’ll have to see what I might do for filament. Not sure donors choose has filament as an option for a project yet. We’ll definitely need to think about how to sustain funding for filament. Our art teacher said A is for Arts would help with art related projects.